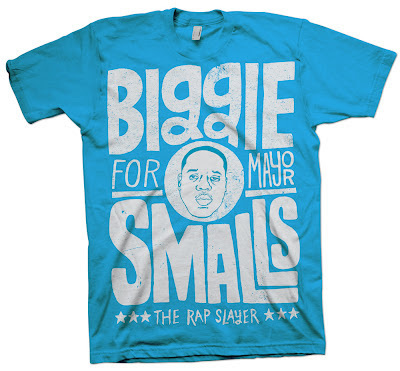 Print Brigade "Biggie Smalls for Mayor"
The great type work by Chris Piascik makes this t shirt a fitting tribute to one of the greatest MCs of all time, Big Poppa. I own the older 2 color version printed on a heather gray blank, but these newer 1 color versions look just as good. Available in both Cyan and Black through Print Brigade’s web store.